Turn your yard into a bird haven in moments using the Gardman Premium Wild Bird Feeding Station Kit. This all-encompassing kit creates a multi-feeder station using a small amount of space, for maximum avian enjoyment. A black, metal pole creates the center shaft, accommodating a wealth of feeder types. The top of the pole has four 10" long, arched hooks, each with some twisted metal for added design. Each of these hooks holds one of the included mini feeders, while an orb and geometric twist adorn the top for a soft look. Two of the included tube style feeders are made to hold mixed seed, while another is meant for peanut chunks. A suet cage completes these top feeders, for a myriad of food for the birds. An additional 7.5" arm rests below the top four hooks, and the smaller hooks on this section are made to hold suet balls (not included). This extended hook culminates in a twist and finial to match the top adornment. An included 8.625" diameter micro mesh feeder tray clamps onto the pole as well, holding up to 1 quart of mixed seed, fruit, or mealworms for even more feeding variety. Complete the station by attaching the included 8.75" diameter plastic bath to it. A metal support ring connects easily to the pole, accommodating the stepped bath for added avian visitors. The steel construction of the unit will withstand exposure to the elements, and the black color blends with any environment. Use the pointed end of the pole to anchor the station at least 16" into the ground. 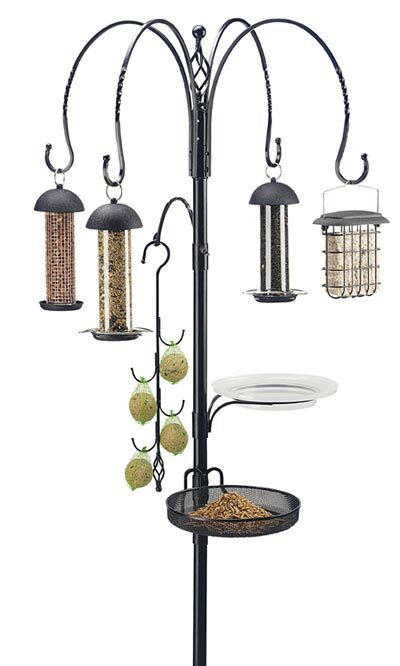 Feed a variety of birds in a stylish way with this Premium Wild Bird Feeding Station Kit. Assembly required. Erva Patio Base for 1" OD Poles, 24" dia.